A charming floral frame is painted in retro 50s fashion, lending unique style and color to this seal and send wedding invitation. Your wording is printed in your choice of colors and fonts. The invitation features a perforated response card printed with your return address on one side and your response wording on the other. Guests fill out the card, remove it and return it to you (be sure to place a stamp on the card for guests' convenience). The price includes printing your wording inside and your return address on the outside flap. Clear round seals are included. We ordered this in the ecru shimmer paper. It is worth the extra money for this upgraded paper! We are sooo thrilled with these invitations. My daughter (the bride) was so happy when she saw how they turned out! We paid the extra to have the proof done and are glad we did. I corrected some things, and then they were corrected by the staff and sent out to us. They arrived quickly and are absolutely gorgeous! I only wish matching thank-you notes were offered. Thank you for exceeding our expectations! My fiance and I love these invitations and are perfect for the tone of our wedding! Super fast delivery. The product was exactly what we wanted; great quality paper, beautiful format, easy to use closure stickers. It would be neat if they offered correction stickers, that would've been the only improvement on their services to us. I wrote out my invites and was ready to sent the order but had my parents proof read it. I still ended up with the wrong date at the top when I got 120 invites in the mail. ...so I hand wrote a "1" in to all my invites. I loved my invitations! They were very well made, and came faster than expected! I also loved that Invitations by Dawn is a "Google Trusted site". This meant my order was insured for up to $1000. This gave me great piece of mind knowing that I was protected, and it also meant Google believed in Invitations by Dawn. Also I love that they did not plaster their logo all over my invitations like Shutter-fly. I highly recommend this site! Better than I could have dreamed! I had searched a long time to locate beautiful wedding invitations that wouldn't drain my entire wedding budget; I thought it would be impossible. My sister origonally found these and thought they would be a good fit and she was absolutely correct. Not only do they look exactly like the picture, the pearlized paper (though ectra) exceeded my expectations. They offered proofs (akso extra) so that I could make little changes here and there. And the shipping?? Soooo fast! Very happy bride-to-be! Thank you. The invitation was beautiful, and just as I had designed. I chose the textured paper and it really elevated the status of the invitation to look very elegant. The postcard section rips off easily, and it is easy to fold (a little resistance from the paper since it's textured, but nothing difficult). Feeding these through the printer was a challenge at first, but once I learned how my printer worked it was easy! 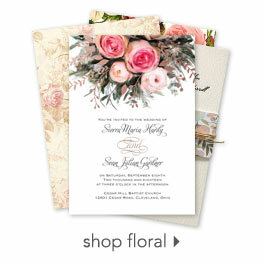 The selection of fonts available and wording was what made Invitations by Dawn the best website out of many others. Proofs were useful, and they do give out free samples, so if you're worried about your color choices, those are very easy ways to check. I'm pretty good with color, so I knew not to do something like light blue or green on white--too hard to read! I went with a chocolate color on the ecru and it looked beautiful. (I don't believe you need to sacrifice readability to stick your wedding colors everywhere). Mine turned out beautiful, and just as (or better!) than I had hoped! So excited to send them out in a few days!! they look beautiful. I can't wait for everyone to see them. We are excited to send these out later this month. They are unique, and showcase the bride's personality. We're sorry that a sample wasn't sent to us to preview before the full order was printed. At that time we would have made changes to the font and ink color, since they were too light to be read. Oh well, we still love them, they just ended up costing us twice as much as we thought we'd be spending, in order to get readable invitations. Keep up the nice work. Just consider not charging for a sample (you charge $5 presently for a proof). Used these as our wedding invitations and loved them. Very easy to run them through the printer to add addresses for recipients. One con - some postcard reply cards got lost in the mail.